Almond Emlsion Mrs Lucas 2 oz of almond, 2 oz of gumaribee, 2 oz of lump sugar, 1 pint of boiling water. Dec 24 1819 [Ploris?] Peptic Mrs [Swire?] Rhubarb 4 drams columba 4 drams ginger 3 drams 1 teaspoonful to be taken well mixed up with Brandy then add a little watter Whole Pine-Apple [Jarrin?] Break off the top & stem of your pines, trim them well & prick them all over with a fork then, put them into a pan of water & boil them till tender take them out & put them into cold water, when cold drain them quite dry & put them into a glass jar or a pan, take syrup enough to cover them boil it to a thread, & pour it on your pines, let them stand two or three days, then drain off your syrup, boil it a degree more, skim it well & pour it over your pines. 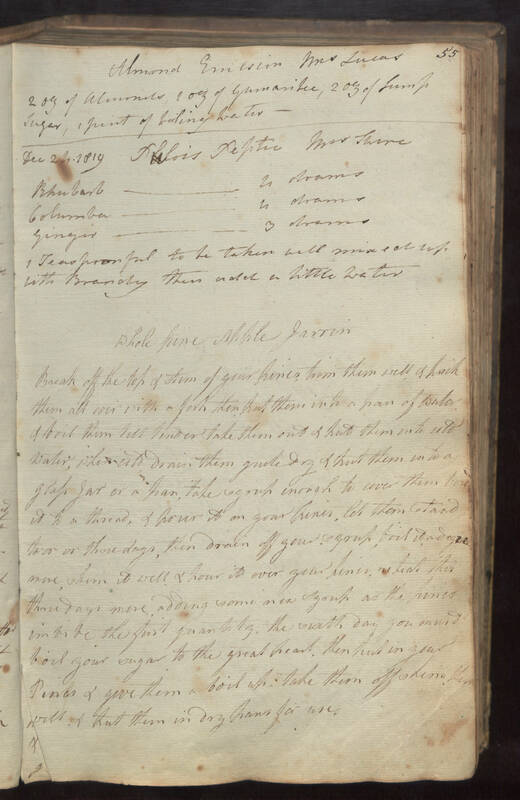 repeat this three days more adding some new syrup as the pines imbibe the first quantity, the sixth day you must boil your sugar to the great heat then put in your pines & give them a boil up; take them off skim them well & put them in dry pans for use.